It’s no small secret that my biggest interest lies in malaria research. The story of this healthy obsession started back during my undergraduate days at USC, back when I was interested in becoming an obstetrician/gynecologist. I liked the idea of this area of medicine because it can involve both medical and surgical knowledge, and because it was an area that was urgently needed in developing countries (I was interested in working with Médecins Sans Frontières). However during the courses I did for my minor in medical microbiology with A/Prof Mohammad Katouli at USC, I got absolutely hooked on infectious diseases and so wanted to change my direction to become an infectious diseases physician and pathologist. The transition of my main focus wasn’t as drastic as it sounds- I became fascinated at first with host-pathogen interactions with a gynecological focus (such as HPV and the development of cervical cancer), then with these interactions as a whole. Then when I started learning about parasites such as protozoans and helminths, I truly was hooked! The complexity blew me away, and I grew ever more intrigued with this apicomplexan parasite. Look at all the different forms of the parasite, all the different micro-environments it finds itself in, how amazing! I knew I wanted to learn more about malaria, so during my Masters in Molecular Biology at UQ I was involved in malaria vector control and a little drug discovery research in Prof. Glenn King’s group at the Institute for Molecular Bioscience. It was during this time that I also learned about the importance of developing a vaccine for this scourge of humanity (it kills between around 700 000 and 1.2 million a year, and half the world’s population is at risk of infection), but also the challenges in doing so, especially since we still do not have one and have failed to produce a vaccine for many decades. 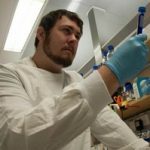 So I made a decision to go into malaria vaccine research since I realized that if you helped design an effective vaccine, you could help more people than if you were a clinician seeing individual patients; however the chance of doing so is much much lower, but why shy away from a challenge? So after a lot of looking around, trips overseas, discussions and a difficult decision as to where I would go, I decided to do a joint Ph.D at the Walter and Eliza Hall Institute with Prof. Alan Cowman, and the University of Edinburgh with Prof. Paul Barlow, this year, in the area of molecular parasitology and structural vaccinology. So that’s my story of how I came to be in malaria research, what I wanted to do now is to walk you through some of the beautiful complexity of this parasite, and leave talking about the horrors of the actual disease another time. I am going to start the story off with a common pest, the mosquito. An interesting fact is that only female Anopheles mosquitoes transmit the malaria causing Plasmodium parasites (only female mosquitoes drink blood for nourishment of their eggs). A special form of Plasmodium, called the sporozoite stage, is stored in the salivary glands of Anopheline mosquitoes, and it is these forms that are injected into the human host. Around 10-100 parasites will be injected in this bite. Now contrary to what many might think, the sporozoites first trickle through the skin with the aid of a tiny biological motor before penetrating into the lymphatics and the blood stream. Many evade immune cells called macrophages (which eat up invading microorganisms) mostly due to their speed; in fact they are around 3 times faster than the macrophages, so it turns into a Benny Hill style chase! Once in the circulatory system, the sporozoites seek out the liver, where they travel through many cells before finding a more central liver cell, called the hepatocyte (this step takes a couple of hours in total). Once in the hepatocyte and coated in a special parasitophorous vacuole-membrane, the each individual sporozoite will turn into a new form, called schizonts. These schizonts contain can contain over 30 000 merozoite stage parasites! It should also be noted that some species of malaria parasite (such as P. vivax) can turn into latent stages called hypnozoites, which can remain dormant for extended periods of time. This is a key point because it highlights the reason it is so important to keep taking prophylactic anti-malarial drugs even after returning from an at-risk region. Now everything that the parasite has done so far in what is termed the exo-erythrocytic cycle (outside of the blood stage, which lasts for up to and around 2 weeks) has surprisingly left you feeling fine and asymptomatic; that is about to change. The erythrocytic, or blood-stage of the infection begins when the merozoites, protected from liver macrophages (called Kupffer cells) by blanketing themselves in a membrane called the merozome, which is actually made of bits of your own cells so the immune system thinks it is part of the “self”, reach lung capillaries and are released into the blood circulation. Cartoon of a merozoite invading a red blood cell including the main stages of cell invasion. falciparum merozoite invasion and insights into invasion biology. Int. J Parasitol 2013, 43:1:1-10. Once in the blood stream, the merozoites take under 60 seconds to invade red blood cells (erythrocytes) via multiple redundant receptor interactions, shedding its old protein coat in the process. This shedding allows the immune system to recognize and respond to this particular parasitic protein, but unfortunately it is just about too late, the parasite is now going to turn into yet another form! 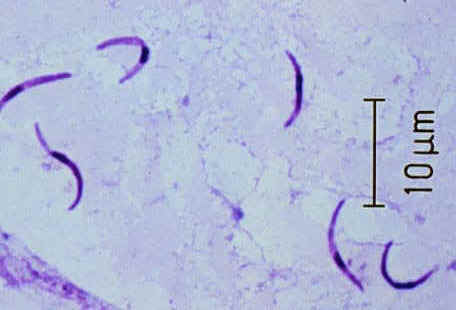 This form is called the ring stage (due to the shape) immature trophozoite. 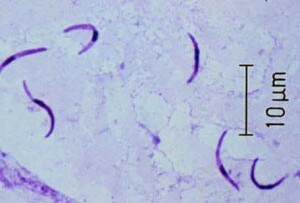 At this point Plasmodium parasites can either develop into sexual forms, or asexual forms. A recent discovery by my friend Dr. Neta Regev-Rudzki in the Cowman group at WEHI shows that the parasites actually communicate with each other by sending signals of packaged DNA from one infected red blood cell to another, allowing them to decide if they should differentiate into sexual forms (this might be a mechanism that occurs if there are lots of mosquitoes around) or continue the blood stage infection, which may play a significant role in control of parasite population density within the host (because of course too many parasite’s compromise host health, which then runs the risk of destroying the parasites nice home, you). This mechanism also facilitates exchange of genes involved in drug resistance. 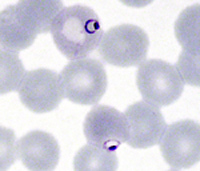 If the parasites decide to continue the blood stage infection, then the trophozoites mature, digest toxic heme into haemozoin and turn into a new form of schizont containing many new merozoites (the process is termed “schizogony”), which go on to infect new red blood cells in a cycle that takes between 24 and 72 hours depending on the species of malaria parasite. This is where the infected person gets cyclical chills and fevers. Additionally disease is due in part to the parasites re-modeling the surface of the red blood cells, making them stick to blood vessels. Pathology and clinical presentation is interesting, but beyond the scope of this article, those interested can go here, or here, or here for more information. If however, the immature trophozoites decide it is time to differentiate into sexual forms, they first turn into gametocytes, which are released into the blood and develop into male and female gametocyte parasite forms. These sexual forms of the parasite are what mosquitoes then take up during a blood meal. Once in the mid-gut of the female Anopheles mosquitoes, the male microgametocyte enters the female microgametocyte (“micro” referring to the small size of the male parasite compared to the female which is designated as “macro”) and development into a motile ookinete parasite form occurs. The ookinete uses its little molecular motor to penetrate the midgut of the mosquito where it can develop into an oocyst that allows for the development of thousands of new sporozoites that eventually burst out and travel back to the mosquito salivary glands to complete the sporogonic, or mosquito-stage cycle, and to start the whole process of infection once again. 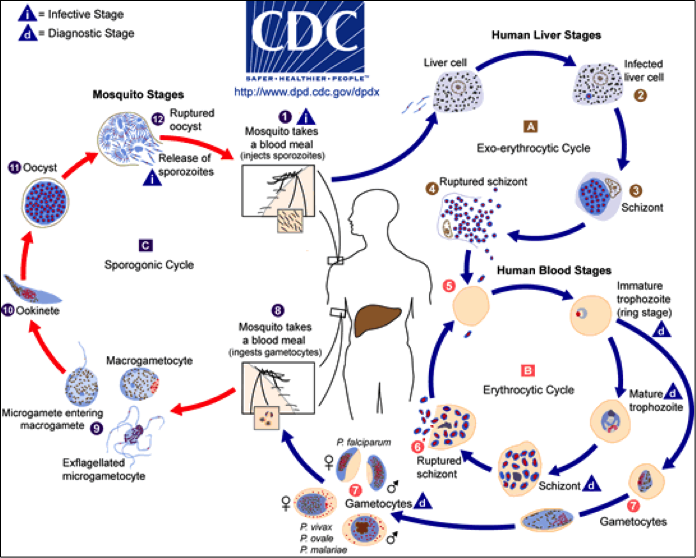 For a video of the whole cycle, please go here and go to the Malaria Lifecycle Part 1 and 2. 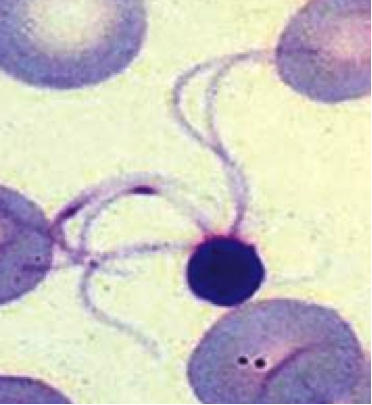 A male P. falciparum exflagellated microgametocyte. recipients. Nature Clin Prac Nephrol 2006, 2:490-503. I hope now that you have an increased appreciation of the complexity of the malaria parasite, and now possess the knowledge that it is due in large part to this complexity that we as researchers have an immense hurdle to overcome if we are to develop more effective ways of eliminating/controlling the disease vectors (mosquitoes), designing new drugs, and developing an effective and efficacious vaccine. For the latter, one of the biggest challenges to overcome is the fact that the parasite changes its antigenic proteins so frequently during its entire life cycle, and has interesting ways of evading the immune system, which I will talk about in another article. I do however think that it is a battle worth fighting given the great cost to human life, and it is knowing this that keeps me inspired every single day that I am fortunate enough to be involved at the cutting edge of this research, that I hope one day helps clinicians and patients alike.